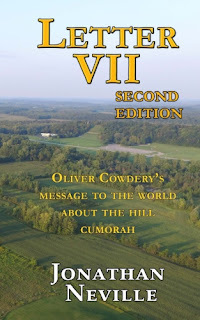 Letter VII (7): Why is there a visitors center at the Hill Cumorah in New York? Why is there a visitors center at the Hill Cumorah in New York? 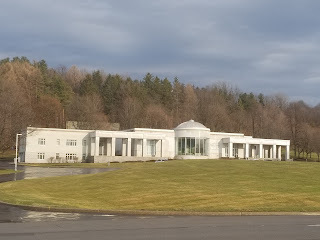 Because the exhibits in the Hill Cumorah Visitors Center teach that Cumorah is in Mexico (M2C, or the Mesoamerican/two-Cumorahs theory), it's a bit of a puzzle why the Church even has a Visitors Center at the Hill Cumorah in New York. Site missionaries are allowed to tell visitors only that this is the location where Joseph Smith got the plates from Moroni. They cannot mention Letter VII or the teachings of the prophets about Cumorah and the Book of Mormon. They cannot even read Mormon 6:6 with visitors, let alone Ether 13. Any discussion of the hill Cumorah as the site of Mormon's depository of Nephite records or the location of the final battles of the Jaredites and Nephites is forbidden. Maybe someday they'll transfer the building to the "real Cumorah" in Mexico. Just as soon as Book of Mormon Central America, or Fairly Mormon, find that location. But at least there is a consensus that Joseph Smith got the plates from the "hill in New York" where the Visitors Center is located. I was curious how we even know that this hill is the one from which Joseph obtained the plates. It turns out, it's all because of Letter VII. 51 Convenient to the village of Manchester, Ontario county, New York, stands a hill of considerable size, and the most elevated of any in the neighborhood. On the west side of this hill, not far from the top, under a stone of considerable size, lay the plates, deposited in a stone box. There are lots of hills in the area, and it's not easy to tell which is the highest. Joseph referred to a "neighborhood," but how extensive was this neighborhood? In Joseph Smith's day, one distinguishing feature of the hill Cumorah was the embankments around it. These have been leveled and farmed now for nearly two centuries, but after Heber C. Kimball joined the Church in April 1832, he visited the site. He wrote, "The hill Cumorah is a high hill for that country, and had the appearance of a fortification or entrenchment around it." "From the time Father Bosley located near Avon, he found and plowed up axes and irons, and had sufficient to make his mill irons, and had always abundance of iron on hand without purchasing. "In the towns of Bloomfield, Victor, Manchester, and in the regions round about, there were hills upon the tops of which were entrenchments and fortifications, and in them were human bones, axes, tomahawks, points of arrows, beads and pipes, which were frequently found; and it was a common occurrence in the country to plow up axes, which I have done many times myself. "The hill Cumorah is a high hill for that country, and had the appearance of a fortification or entrenchment around it. In the State of New York, probably there are hundreds of these fortifications which are now visible, and I have seen them in many other parts of the United States." Heber's biographer, Elder Orson F. Whitney of the Quorum of the Twelve, commented "Readers of the Book of Mormon will remember that in this very region, according to that sacred record, the final battles were fought between the Nephites and Lamanites. At the hill Cumorah, the Nephites made their last stand prior to their utter extermination, A.D., 385. "Thus was Heber preaching the Gospel to the Gentiles, above the graves of the ancients of Israel, whose records with the fullness of that Gospel, and the relics of their prowess and civilization, were now 'whispering from the dust.'" But still, this description gives us no specifics about which of the hills was the actual hill Cumorah. You are acquainted with the mail road from Palmyra, Wayne Co. to Canandaigua, Ontario Co. N.Y. and also, as you pass from the former to the latter place, before arriving at the little village of Manchester, say from three to four, or about four miles from Palmyra, you pass a large hill on the east side of the road. Why I say large, is because it is as large perhaps, as any in that country. To a person acquainted with this road, a description would be unnecessary, as it is the largest and rises the highest of any on that rout. The north end rises quite sudden until it assumes a level with the more southerly extremity, and I think I may say an elevation higher than at the south a short distance, say half or three fourths of a mile. As you pass toward canandaigua it lessens gradually until the surface assumes its common level, or is broken by other smaller hills or ridges, water courses and ravines. I think I am justified in saying that this is the highest hill for some distance round, and I am certain that its appearance, as it rises so suddenly from a plain on the north, must attract the notice of the traveller as he passes by. We find it fascinating that the Church built the Visitors Center at this location by relying on President Cowdery's Letter VII, but the displays and literature in the Visitors Center never mention Letter VII today. Members of the Church have to dig hard to find out what President Cowdery and the other prophets and apostles have taught about the New York hill Cumorah.